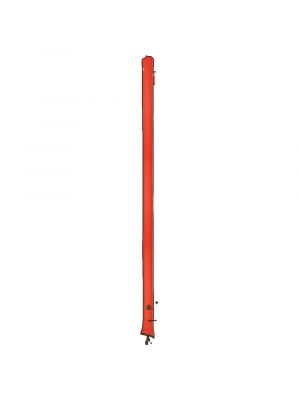 The 10-foot Open Ocean signal tube is what you want to have with you for the highest degree of visual detection. It comes equipped with an installed LP inflator valve for easy inflation from your low-pressure inflator hose (can also be orally inflated from same valve by simply depressing it and exhaling air into the signal tube). You may also inflate it by free flowing air from the regulator into the bottom of the tube which has a one-way internal membrane designed to keep air in but not let it out. Air is released by activating BCD style dump valve. Includes light stick holder, whistle and nylon mesh storage bag. When rolled up, the Open Ocean tube measures approximately 4 x 7in.